I got seriously lucky when I had my first facial. Space NK had just opened in Notting Hill, and my mum had given me £150 as part of my Christmas present, so I poured almost the whole lot into the single Eve Lom facial in the treatment rooms. It was a spectacularly good choice, given that almost no research had gone into it. In the hour and a half, I was introduced to the joys of thorough cleansing, had wax stroked onto my face to soften blemishes and then removed before extractions took place, was given a lymph-draining massage, and sent on my way with a list of products to buy for which I, of course, had to wait until my birthday. Afterwards, my acne was calmed, and a budding interest in skincare formed. Since that facial, I must have had in the hundreds/possibly thousands of treatments designed to do everything from firm and calm to reduce redness and pigmentation. 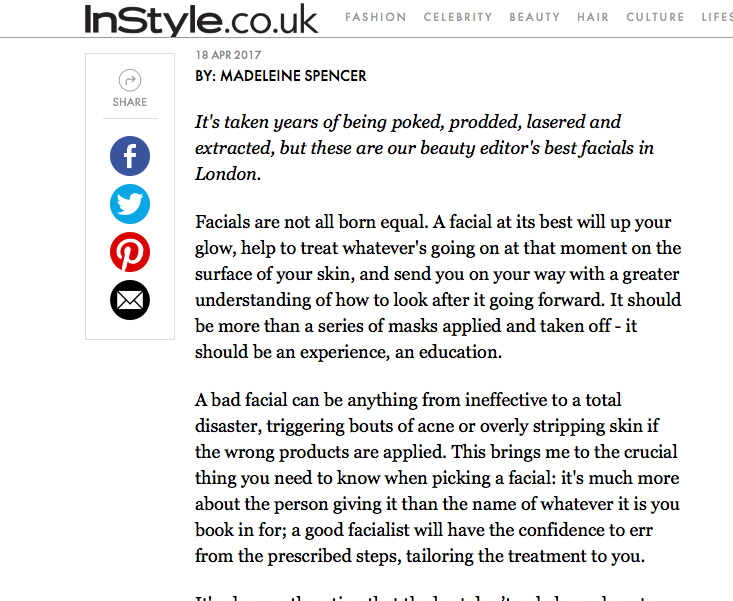 A handful of those I’ve had proved effective, so I wrote about them for InStyle UK last week. They don’t follow formulas / A facialist who will give you the facial you booked in for regardless of what’s going on on your face is not worth the spend. Look for someone who’s devised a signature facial that doesn’t promise a particular form. They don’t just rely on masks / They have techniques, instead. A facial that involves a series of masks being slapped on and not much else is, again, hardly worth the spend – you might as well just buy the masks and do them at home. They have life stories that have informed their technique / This may sound an odd point to make, but I’ve noticed that good facialists are also really bloody interesting people who have been on a journey that’s shaped how they treat the human, not just the skin.